Here it is: the Subaru BRZ tS, the car we were kind of hoping would be some sort of insane turbocharged BRZ STI. Actually, it was developed by Subaru’s STI division, but more power isn’t on the table. What Do You Want To See From A Subaru BRZ STi? 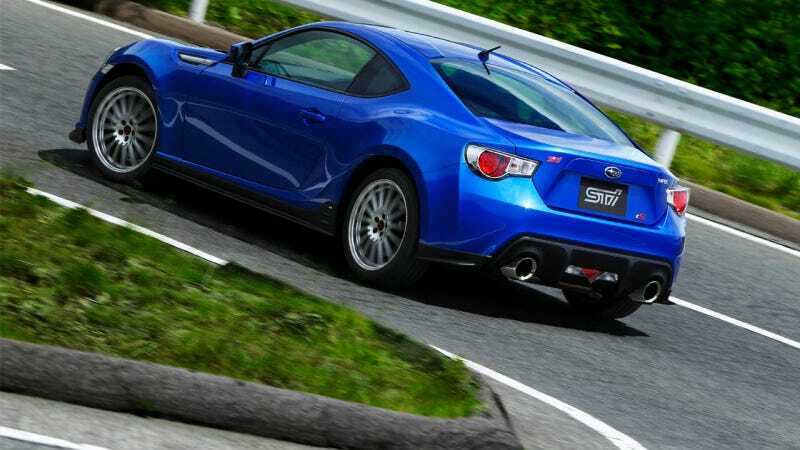 Instead, according to Subaru, the tS offers a host of improvements designed to bolster the BRZ’s “agile handling pleasure.” Their words, not mine. Enhancements on the BRZ tS include Brembo ventilated disc brakes, and an STI front under-spoiler. There’s also a “GT Package” version with an STI-designed dry carbon rear spoiler, black colored BBS 18-inch aluminum wheels and Recaro seats. Only 500 tS models will be sold in Japan, and no announcement was made about plans to bring it to the U.S. It sounds like a pretty sweet package, but those of us hoping for a bump in power will just have to keep our fingers crossed longer.